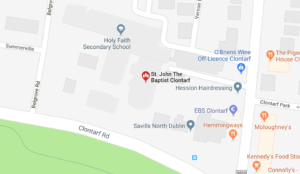 This is the Child Protection Policy of St John the Baptist Parish, Clontarf Road, Dublin 3. It has been devised in accordance with the guidelines of the Dublin Archdiocese and current best practice. The Archdiocese of Dublin recognises and upholds the dignity and rights of all children, is committed to ensuring their safety and well being and will work in partnership with parents/guardians to do this.The Archdiocese recognises each child as a gift from God , and values and encourages the participation of children in all activities that enhance their spiritual, physical, emotional, intellectual and social development.